Did you guys know I have a sister? A sister that is pretty much my bff. 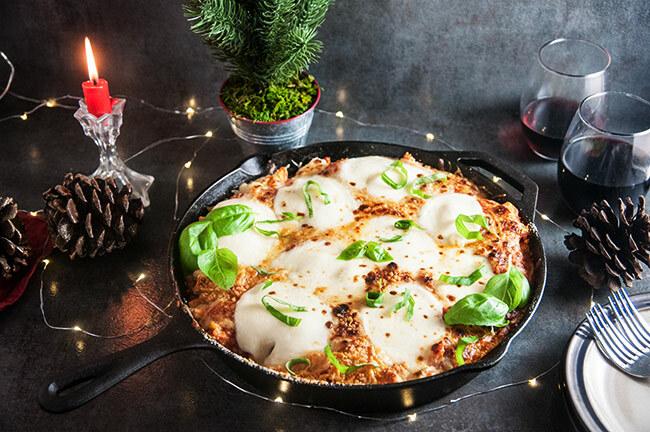 Why is that a thing I’m bringing up right now, and what does this three cheese skillet ziti have to do with her or the fact that Christmas is this week and I fully consider this a Christmas recipe even though it isn’t gingerbread or a fancy meat dish. My lovely sister is a vegetarian. Ok, I can get behind that. I was a vegetarian for many years in college and my early twenties. But not only is she a vegetarian… she’s picky AF. There’s family legend about my sister going to BK and getting a whopper (back in her meat eating days) without onions but a side of onion rings. But now she’s vegetarian. And she’s pretty picky. But I want her to be able to eat on Christmas Day. Not only do I want her to eat, I want her to leave full and happy. After all the rest of us will be eating this Christmas stuffed flank steak and mascarpone mashed potatoes. She’ll eat the potatoes but I want her to have more options. And I want them to be equally delicious. 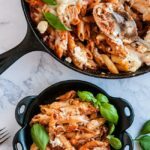 Enter this three cheese skillet ziti. It’s something I know she will eat. We have lived in the same area our whole lives and have always gone to this same little local pizza shop. 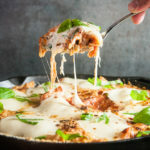 While their pizza and cheesesteaks are great, we go for the baked ziti. We grew up on this stuff and my sister eats it to this day. This is my homemade take on that. 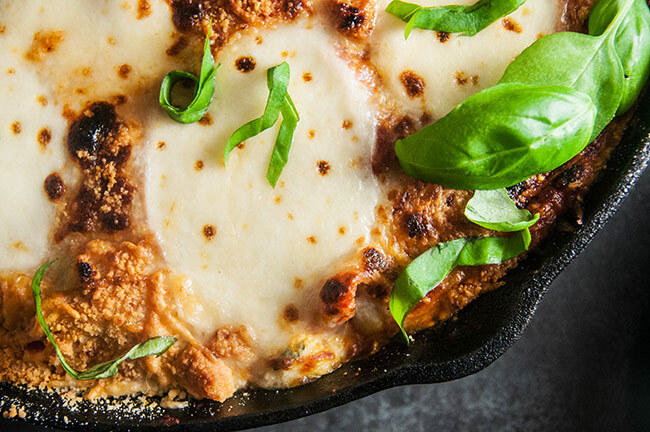 But unlike other baked pasta dishes, this one is in a skillet and it’s pretend baked. Rather than baking it for the better part of an hour in the oven on Christmas Day when oven real estate is at a premium, I’ll assemble this on the stove top in a cast iron skillet and finish it off under the broiler for about 3 minutes to let the fresh mozzarella on top get bubbly and delicious. This trick is golden. It takes the cook time and makes this dish take exactly 3 minutes longer than the amount of time it takes to boil the noodles. And you still get that delicious, gooey, bubbly, melty cheese topping. So much cheese. Literally so much cheese. In the recipe, I will give you the amounts of cheese that I used. 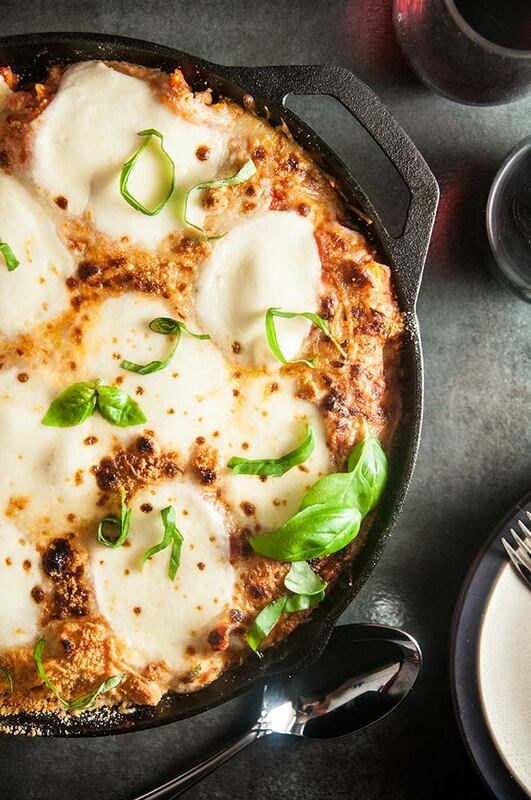 With the exception of the ricotta, you could totally use more if you want. Feel like 10 ounces of fresh mozzarella isn’t enough? No prob, add more. Want it extra parm-y? That’s cool. Add more. As for the other ingredients? Well cheese has been established. The rest is 12 ounces of uncooked penne or ziti noodles, 42 ounces (1 big can and 1 regular sized can) of tomato puree, about 3/4 a head of garlic, some water or wine or broth and a healthy amount of evoo. The rest is seasoning: red pepper flakes, fresh basil and parsley, and a hint of lemon zest. You can imagine how amazingly good this tastes. Rich, cheesy, garlicky. A little fresh from the herbs and lemon. Perfect. 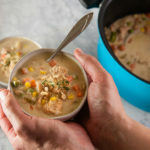 And while I make this on the holidays, I would also make this pretty much any time of year but especially in the colder months when I want something perfectly carby and comforting. So I leave you with this delicious cheesy goodness, and I wish you all the happiest holiday season. I’ll be taking a bit of a blogging break from now until after New Year’s Day, but I’ll be back on January 2 with a delicious and healthy dish to balance out all the cheese and cookies. Thanks for joining me this year here and can’t wait to catch up again next year. 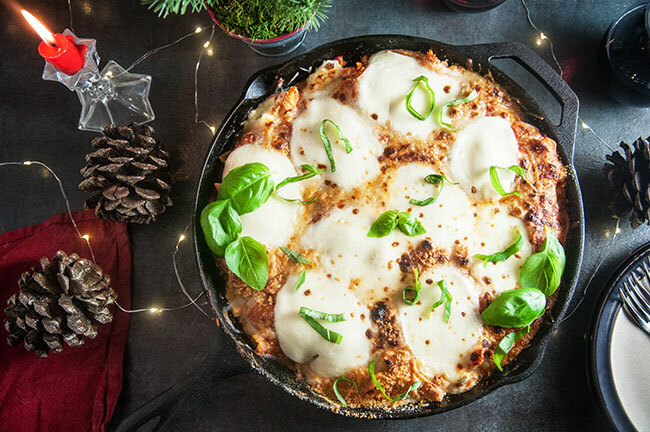 Delicious three cheese skillet ziti cuts down the prep time on traditional baked ziti and offers a vegetarian meal option perfect for a holiday gathering or a cozy night in. Boil a large pot of water and cook noodles according to directions on package, reducing cook time by a minute of the lower end of suggested cook time. If it says 8-10 minutes, cook for 7. 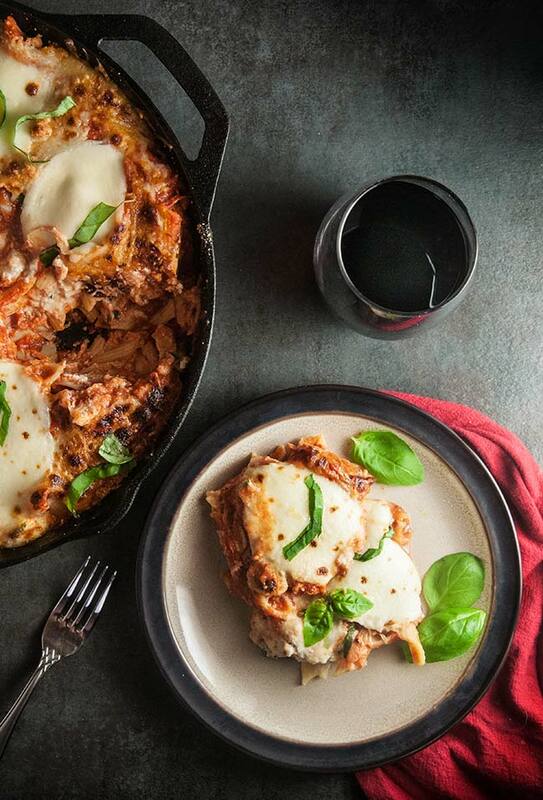 While you are waiting for water to boil, heat a large cast iron skillet over medium heat. Add olive oil, 7 pressed garlic cloves, unchopped basil leaves, and the large can of tomato puree. Season with red pepper flakes and salt and pepper. Cook until the basil begins to wilt, stirring regularly and pull basil out. Continue cooking while waiting for noodles to finish. While the sauce and noodles cook, stir together all the ingredients for the ricotta cheese and set aside. When noodles are done, drain pasta water, reserving 1 cup of water if using water (or skip if using wine or broth). Add noodles to skillet with sauce. Stir in grated parmesan cheese. At this point, add reserved water (or broth or wine) a little at a time, to thin sauce to desired consistency. The sauce shouldn’t be too thick or noodles will be dry. 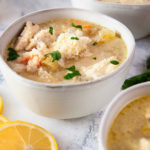 Stir in shredded mozzarella and parmesan. Add the ricotta mixture in even dollops throughout pan. To finish, open the reserved can of tomato puree, stir in the extra garlic clove and a little extra red pepper and salt and pepper and pour over top of pan. Distribute the slices of mozzarella evenly across the top. Place skillet on top rack of oven, under broiler, and broil for 2-3 minutes or until the cheese is melted and has some small golden spots. Remove from oven and sprinkle with basil ribbons. Sever hot and enjoy. *Don’t be intimidated by the length of this recipe. None of the prep is complicated- there is no chopping. It all comes together super fast and easily. **We used gluten free penne. Feel free to use whatever you like. 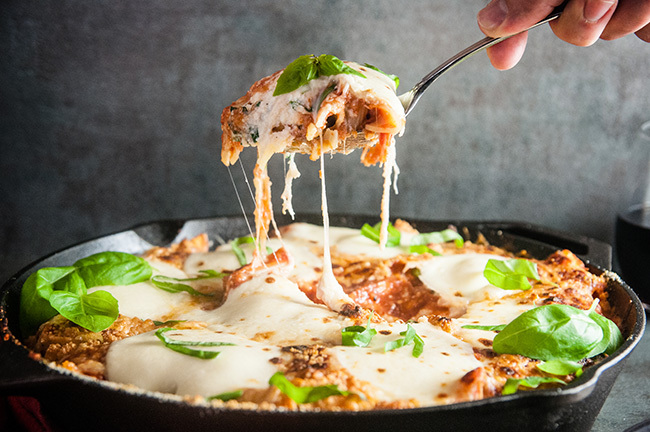 ***Feel free to add more mozzarella and parmesan. Extra cheese is always good. 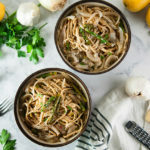 The recipe looks easy and super delicious. I am definitely going to try it soon! Omg this looks so good! I love how I can make this for a vegetarian option for a christmas potluck im having. yum! That’s how this recipe was born! Needed to feed my vegetarian sister!